Gorgeous beachfront condo that has it all! Oceania 4 is a luxury 4,000 sq ft beachfront 4 bedroom, 4.5 bath condo encompasses the entire 6th floor of Oceania (the first two floors are the indoor pool and fitness center). Small private building has just 14 condos, each with floor-to-ceiling windows, and balconies on all sides of the building. 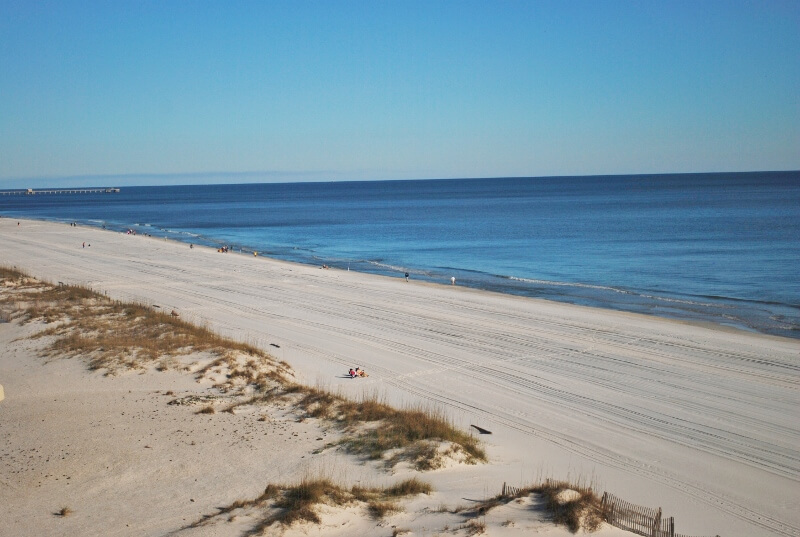 Located on a gorgeous stretch of Gulf Shores sugar-white sand beach. 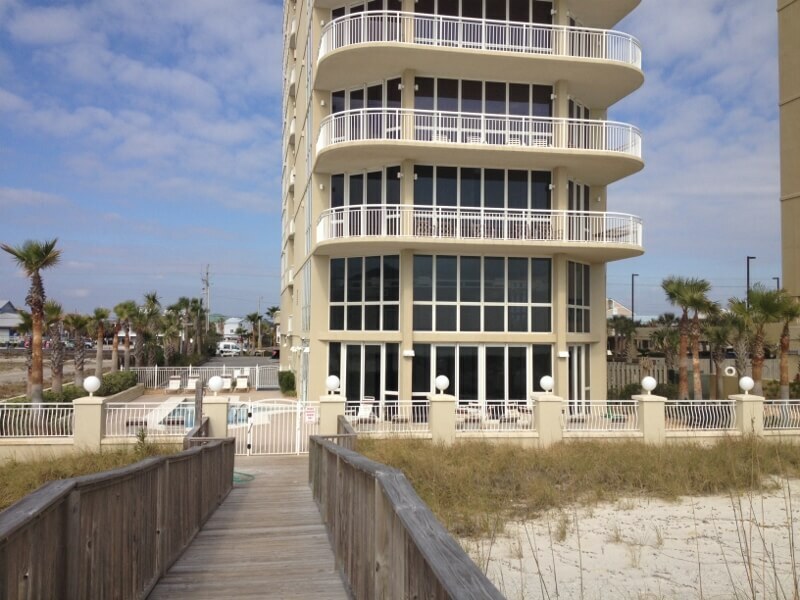 The condo has a 30' wide great room with beach views all around, a wet bar, a big dining table, a long breakfast bar complete with bar stools and a 60' flatscreen TV. Wi-Fi, of course! Well-stocked & gorgeous kitchen has granite counters, stainless appliances, an oversized refrigerator and lots of counter space for multiple cooks. We stocked it for those of you who like to cook. Each of the 4 large bedrooms has a private bath, a balcony, seating, and a large flatscreen TV so you have both space for togetherness, and a nice getaway. The master king bedroom has a deluxe bathroom with a jacuzzi tub, and large separate shower. A second king bedroom has both beach views and a lagoon-view balcony, plus a large chaise-type sofa to relax. The third bedroom has a pair of queen beds, a loveseat-sized sofa and a beachview balcony. The fourth bedroom also has a pair of queens and a lagoon-view balcony. It has a pair of huge bean bag chairs that are perfect for the kids to settle in if they bring along their favorite game system. 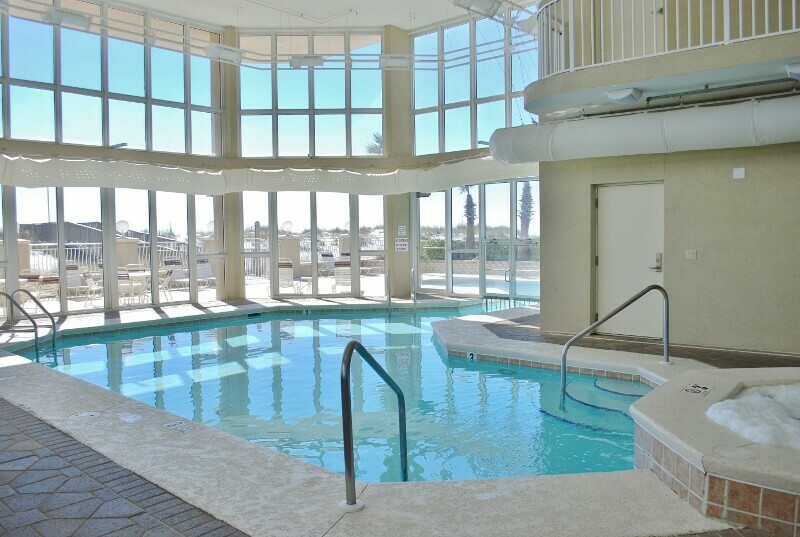 Oceania has an indoor/outdoor heated pool and indoor hot tub that can be enjoyed in any weather. The pool area also has a grill and tables and chairs. It leads right to the beach walkover so you a just a few feet from the beach, not hundreds of feet. There is even beach service available so you can arrange with Ike's Beach Service to have your chairs and umbrellas waiting for you right in front of the condo. There is also a fitness center on the condo's second floor. Oceania is located in Gulf Shores .8 miles west of Hwy 59 and the Hangout, so you are close enough to easily walk to Bahama Bob's for dinner, or down to the main public beach, the Hangout and more. It is a great combination of quiet building, yet close to everything. Just a note, we send arrival information to everyone including how to get the key, and where it is used. We have not previously had to show anyone how to hold it up to the scanner but we'll check the instructions and see if we need to add more detail. This was an exceptional condo on the beach and we would highly recommend this property. Plenty of room for everyone and the kitchen setup was great as well. Will be staying here again! My family and I loved staying at Oceania 4 - it was well furnished, clean and roomy. The kitchen was stocked with all amenities. The view from the balcony was fantastic! Loved our vacation home. Great condo, lots of room for the 8 of us. Very convenient to all attractions, restaurants, shopping, etc. Pool and hot tub areas, very nice. BBQ grill needs some upgrades. We love Oceania!! Have been staying here with our family of 11 for many years with plenty of room. We called Geoff one afternoon about air conditioning in a couple of bedrooms and repairman was there and fixed it that evening. We really appreciate the swift response. Thank you! Everything about this condo was great! Tastefully decorated and informally welcoming. Just the space to relax and enjoy the beach. Plenty of room for families to spread out. Can't go wrong here! Susan and Geoff are super nice and we plan on visiting again next year! The website photos do not do this unit justice. From the really cool way you step off the elevator and be in the unit, to the HUGE bedrooms and family room spaces, everything about this condo is special. The wrap around balcony was perfect for seeing the stunning sunsets (and sunrises for the early birds) and to sit out in the sun sipping wine. The kitchen is large and easily accommodated 4 or 5 of us milling around and putting together our Thanksgiving feast. The only "negative" comment is that it would have been nice for the large windows to have been cleaned from the outside. They were not foggy, but you could clearly see streaking and some film on them. Great layout with tons of common space for a big family to hang out. Furniture and utensils are some of the best (we've stayed in 3 other units at Oceana). Parking is the only aggravating part. Each unit gets two spots, which is fine, but we had two cars with handicap tags. Even so we couldn't get extra tags and had to just leave our two marked spots empty, which makes absolutely no sense. Everything was great!!! 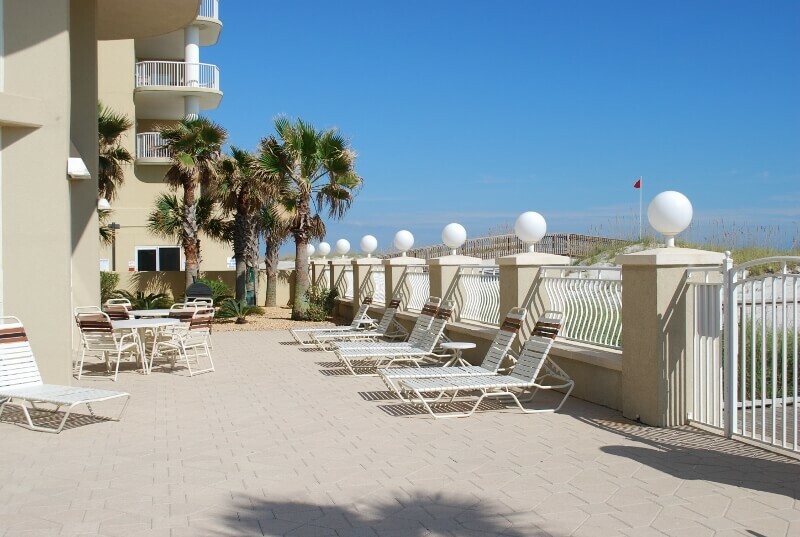 The beach, the location of the property is right on the beach, the pool and hot tub at the facility was wonderful, and the unit itself could not have been better. It was all that was advertised and more. We were Very Happy. We had a problem with a water faucet while there and the property staff were very responsive. Answered the phone and sent someone over straight away to get it resolved. I would recommend this property to anyone, but especially for families!!!! We love Gulf Shores and Oceania 4. The management is wonderful and very accoommodating. Paradise in Gulf Shores. We had 4 couples sharing the condo and everyone was very pleased with the accommodations and the location. The condo is very spacious with big rooms and ensuite baths plus a large open plan kitchen, living and dining room. The view from the living room is breathtaking and we had lovely sunrises over the ocean each morning. We were there in Nov so did not go into the ocean, but the condo is stocked with all manner of beach games, water boards, chairs and umbrellas and it's a short walk from the condo pool deck directly to the white sand beach. The condo location is great - it's near restaurants, shops and outdoor activities but has a very secluded feel. We also enjoyed the heated indoor pool (there is also an outdoor pool) and the hot tub! 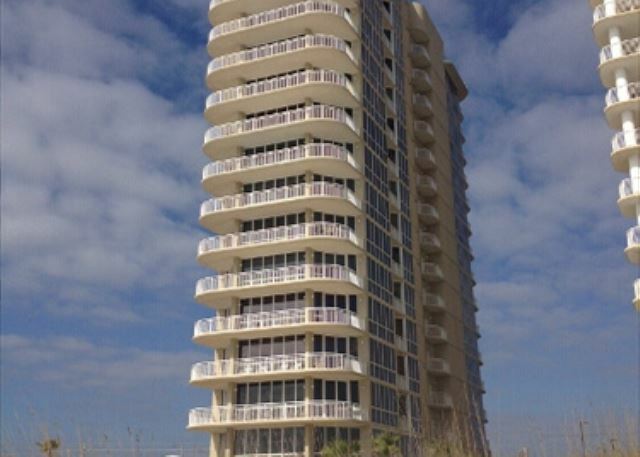 Oceania 4 will definitely be our vacation spot in Gulf Shores! We hope to return again next year! Such a wonderful condo .. everything was just perfect ..would definitely stay there again however it would be wise to make sure the construction next door hasn't started before make a reservation. Oceania far exceeded our expectations. It was immaculately clean, had plenty of room for our extended family, immediate access to the beach and a spectacular view! Big things are great. Small things are a nuisance. We love this beautifully decorated, beautifully equipped condo. I always feel let down when I return to my bathroom and my décor. But little things are annoying. We desperately need a manual for basics.....operating cooktop, TVs, even the elevator, how to get out of exercise room (scary to think you are trapped in there). But this time a new one happened. A quick power outage (5 seconds) late at night. I am the only one awake and I am hearing doors slam. Magnetic doors were apparently deactivated and we had no idea how to reactivate. A real nuisance as we left early the next morning. Warn me of this in manual. Awesome Condo for Family Vacation! Wow, this spacious condo was beyond our expectations! Condo location, accamodations, facilities and security were exceptional. 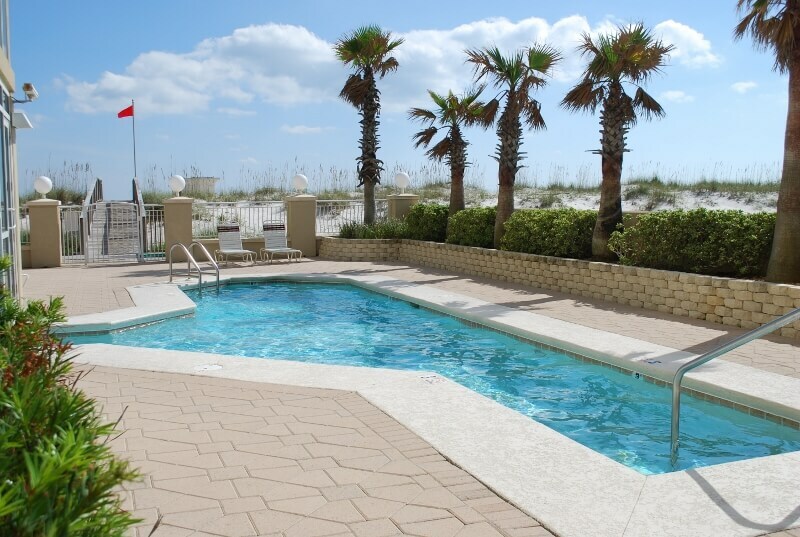 We have vacationed on the Emerald Coast for over 30 years and this condo was the best ever! This will be our second year to stay at Oceania 4. We love everything about it. The location is perfect, close to everything. It is perfect for families ( we had 11 family members this time ). The furnishings are perfect,...very upscale and comfy. And the beach...what can I say about the beautiful beach, but perfect. Have you noticed I have used PERFECT a lot in this review? BEACUASE IT IS !!!! Geoff and Susan are pretty perfect too. Oh and did I mention the condo is perfect? We rented this unit last year with 3 other couples. We shared that experience with our children and they thought it would make a great family vacatio and that it was! The grandchildren didn't want to leave. The accomadations for three families was outstanding and we will certainly return in the future. It's was wonderful in every way , The condo was beautiful , near everything, plenty to do , The beach and views were wonderful ! Our time there with family is a memory of pure enjoyment! We were at Oceania 4 for three weeks (our second year there). We had a wonderful time. Susan, our Gulf Shores Vacation rental agent, was such a help in helping us with scheduling fun events. We went on a sunset dolphin tour one night, had a personal chef come in to prepare dinner for us one night and had massages in the condo one evening. I can't say enough good things about Susan and her help. The condo took care of all my family's needs. The owners took great care of anything needing attention. Very nice condo with great location and proximity to beach access, shopping and dining. Management was very responsive to a couple of small issues (A/C minor repair). We loved this property. It was spacious for our group of 4 adults and 4 kids. We used all the decks and the floor to ceiling windows were stunning. We had several rainy days so we all in joyed the hot tub and indoor /outdoor pool and lots to do nearby. Only problem was the 2 queen beds need to be replaced and one if the deck doors in the living room was difficult to open and finally the handle came off. We all would come back again! Our family loves staying in this beautiful and spacious condo. We already have reservations for October 2017. This will be our 5th vacation to enjoy this condo with its gorgeous views and sandy white beach. We had a wonderful stay. The weather was great as was the beach. Jeff and Susan are so nice to work with. They are very accommodating. Oceania 4 is the best condo I have ever rented and I have stayed all over the world. I will be making this an annual vacation. We had a great experience with GSVR and this unit. The unit was huge and was very nice, clean, and convenient to everything. All your beach needs are in the unit (chairs, toys, umbrellas. All the rooms are huge and all the bedrooms have a on-suite bathroom and walk-in closet. The communication from GSVR was great and the key was left just as they said it would be. They were very nice to work with. Everything worked in the unit although the TV in the living room is a little difficult to operate. Also it was difficult to find the garbage shute and the maintenance man had to show us were it was but once we found it all was perfect. One thing I would suggest is extending the hand rail on the walkover down to its end. There is a high step down to the beach and my elderly mother had a very difficult time getting up and down to/from the beach and could have easily fallen if we had not been walking with her. All in all this was a great unit and I would recommend it highly. This place was exactly as advertised. It was very clean and beautifully furnished. The location was perfect. We had ample room for our entire family. Everyone loved it. An amazing week at Oceania! The Oceania was a beautiful vacation condo. We were on the 4th floor and our unit was beautifully decorated with high end everything! The bedrooms were huge as we're the kitchen and living areas. It was an easy walk to the beach and both pools were great! We enjoyed this unit so much we have already booked it for next summer. Beautifully decorated condo, great location, beautiful views! The best rental we have ever stayed in! The condo floor plan is well designed. Plenty of room and plenty of privacy! 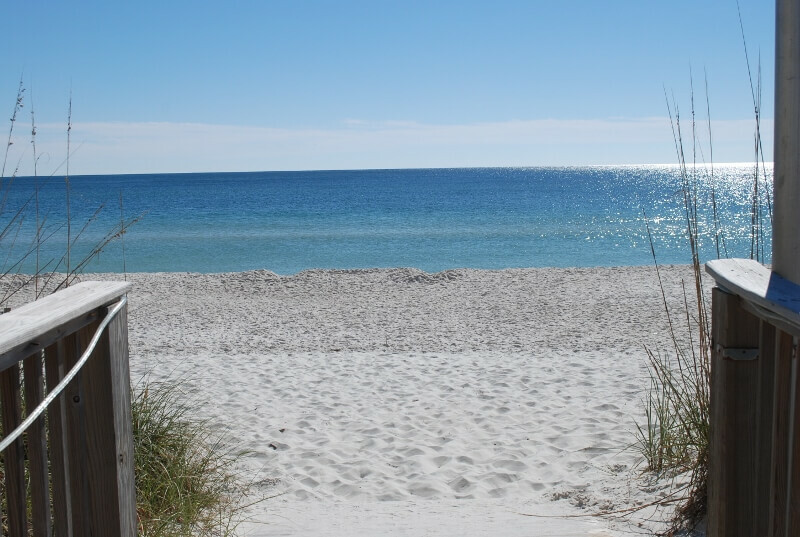 Close to everything Gulf Shores offers. We loved our extended family vacation and can't wait to return! We truly loved Oceania 4 and plan to return next year. Would definitely recommend it to friends. The process of rental was unsettling in that there were no people to talk to. only voice mail and email. The office door was locked and no hours posted. The unit is open to the elevator at all times, no way to lock it off. The door to the trash bin cannot be locked. In short I did not feel secure. We are a small family business and try to be very hands on with our properties so we don't always have someone in the office on check-in days, we are usually up and down Beach Blvd. Since our guests have a cell phone number for use any time day or night during your stay, we don't limit that to certain hours. If you are here and you need us, please call. The elevator opens directly into the foyer. If you call the elevator from inside the condo, or someone in your group uses their key to send the condo to your floor, it will open into the elevator. The elevator cannot come to your floor unless you call it or someone in your group with your key card requests your floor. The door from the condo to the trash chute opens to a small outside balcony with no access to any stairs or other doors. It is for fire safety that the trash chute is outside the condo. You would have to rappell off the roof to reach that balcony. It does not lock because you would not want to risk taking out the trash and being locked out with no way to get off that small balcony. Most people think the building is overly secure! We enjoyed everything about this beautiful condo. There were six adults and two children, and we all had plenty of room. Great views and you're right on the beach. We are already planning our next visit. The condo was beautiful, we plan to go back. Beautiful place, fully equipped. We were there for Thanksgiving and cooked dinner, we had everything we needed. The beach is gorgeous, the views of sunset were breathtaking. Our family plans on going back yearly. It was wonderful. A great view and a few steps away from the ocean. Plenty of room for a total of 11 women and a child. The child really enjoyed the long hallway to her room. It was very cleaned , updated appliances and decorated as a penthouse.I highly recommend Oceania 4. Susan/Property Owners and Managers was wonderful making our women's retreat comfortable, relaxing and very enjoyable. She was Great! We celebrated our 40th anniversary with three other couples (also celebrating their 40th anniversaries) in the gorgeous Oceania4 condominium. The online photographs do not do it justice! Stepping off the elevator into the unit's foyer was just a hint at how beautiful it was...and we felt like we were in the penthouse. We quickly made our way to the wrap-around balcony and caught an incredible sunset on our first night. The weather was great & we walked on the beach almost every day, as well as the pool & hot tub. We hope to be able to return to Oceania again in the future. The condo is beautiful and was of great size for our family. Our one-week stay at Oceania 4 was amazing ! All ten women agreed that the property was stunning. LOTS of room for everyone and the beds were fantastically comfortable (better than my own bed at home) ! Everyone agreed that she'd had NO trouble staying here again (can we say GURLZ WEEK 2015 ?) ! The main deficiency in the condo was the lack of a good strong WiFi connection (although my computer indicated that the signal was strong). I was almost not able to access the internet except for brief occasions. The other 2 ladies who brought their laptops had the same difficulty. We did not take our computers out of the condo to try find a better connection . . . and we had the same problem with trying to use the next-door complex's WiFi (as had been offered). One thing that we were all surprised at was being required (as part of the check-out procedure) to wash, dry, and fold all the towels in the unit. This is the first time any of us have had this stipulation. It wasn't until I was back home in Louisiana and able to readily and reliably access my email that I discovered that a last load COULD be left tumbling in the dryer (when I got the final instructions by e-mail as to check-out procedures). One other deficiency was the lack of instructions on operating the television remotes. We are NOT bumbling newbies to television/DVR/satellite remotes and for the most part, it was just trial and error (sometimes without success) to even begin to access properly the various components . . . sometimes there was even more than one TV remote (without batteries) in each room. Even with those 2 main problems, all in all, it was a fabulous condo and we had a marvelous time. We felt quite the QUEENS OF SHEBA in this condo. Oceania 4, Couldn't Ask for More! This was our second year at this beautiful condo,and we're already planning to go back next year. The pictures are stunning but can't compare to the real thing. Susan is wonderful to work with, and is always available for help or questions. We can't imagine vacationing anywhere else. This is our 2nd year to rent this unit. As everyone involved in this stay has the same positive feelings, we hope to make staying at Oceania 4 an annual trip. Very nice condo with a great location. It had almost every thing you could need. The only missing item that I thought should be there was blow dryers in the bathrooms. The wireless internet connection was very poor and made it difficult for those of us who needed to have good access. Maintenance people wanted to spray for bugs in the kitchen during breakfast. When we said no because of food and a toddler present, they agreed to limit the spray to only some enclosed storage areas. Space is great. The weather was very windy and cool, so we greatly enjoyed the indoor pool. Oceania 4 exceeded all our expectations and was better than the pictures show. The property is in need of a new grill though. The condo was gorgeous and huge! We had 6 adults, and 6 children, ages 4 months to 15 years. The condo was very child friendly, yet beautiful. There were ample dishes and cookware. The appliances were very up to date. The only problem we experienced was that college spring breakers were staying on a couple of the higher floors and were very loud at night and hogged the elevators (and the indoor pool during rainy days). There were at least 30 spring breakers staying there, which was surprising to us. I cannot say enough good things about the condo, just be careful when you book it. The vacation rental was wonderful. Spacious, clean and exactly like posted on the web page. This home is luxurious, spacious, and had everything anyone could ask for. It's close to restaurants and attractions. There was more than enough space for all of us to visit in the common areas and the bedrooms afforded us great views, space and privacy. We would definitely recommend this unit. Wonderful . Very comfortable and clean. Friends visiting loved the condo, maybe a little jealous! Convenient to everything. This is the second year in a row that we have stayed at Oceania 4. The pictures of this place don't do it justice. It is very large and very comfortable. If we have ever had any issues, we simply call Geoff or Susan and they take care of it. We had a problem this year when someone parked in our reserved parking spot. It was about 10:00 at night and Susan personally came to help have the car towed so that we could park in our spot. We have never had any issues with the condo itself. The beach is gorgeous and clean. The pool and the hot tub are well maintained. Also, the management company representative's that take care of the common area's are very nice and professional. In our experience, you can't go wrong renting this property. 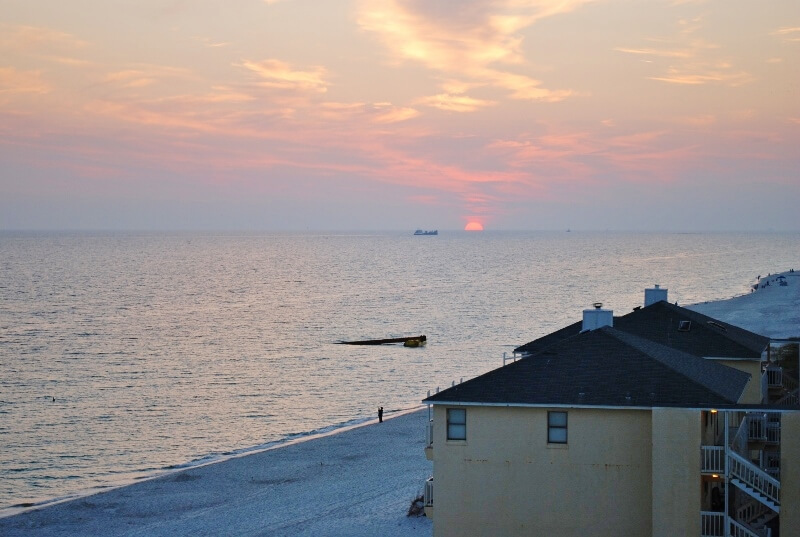 My husband and I traveled with our two sons and their 3 friends to Gulf Shores, and the accommodations couldn't have been more perfect. They layout was divided so that we basically had our personal "half" of the unit separate from the boys; very spacious and tastefully decorated. The location of Oceania was perfect being close to Bahama Bobs and The Hangout, so the kids were able to drive or walk most places without us having to worry. The beach attendant from Ike's was always there ready to adjust our umbrella on this surprisingly uncrowded beach. Great views from the front balcony! The pool area was small but never crowded and always kept tidy. The pictures just don't do this place justice. It was so beautifully decorated & so spacious for our family. WISH WE DIDN'T HAVE TO LEAVE!! We made sure to book for our annual vacation in 2016 before we even went home. Thank you for sharing this beautiful unit with us Susan & Geoff. Four couples rented this condo for a week. There was plenty of room for everyone. Beds were comfortable. Unit was clean and furniture was comfortable. The pool was great. The televisions were difficult to get set up and there were no instructions. Talked with management and they sent someone over the next morning. We had lots of good seafood. Would recommend Sea and Suds, The Oyster House, Jesse's, Bahama Bobs. We would stay here again. We have to say we missed our normal procedure of turning on each television to make sure the inputs are correct when we check the condo before your arrival. When guests do change those inputs, we are nearly always able to talk them through getting back to the correct input, but sometimes we have to come help. It was wonderful!! The condo was large, beautifully decorated, and very clean. It is a great place to stay with a large group as there is plenty of room for everyone. Our stay at Oceania 4 was perfect. We loved the condo and the spaciousness it provided. It was right on the beach and outside you can rent beach chairs for the week with umbrellas. The management was helpful and quick to send someone over when the refrigerator acted up. Our family decided this was our best vaca ever. We will be coming back. Great week, perfect weather and a beautiful spacious condo to relax and enjoy with our extended family! This is our second stay in this condo - we LOVE it!!! Geoff and Susan are great to work with! The only complaint I have about this property is the Electronics, TV in bedroom never worked and the Microwave needed repair (door) otherwise this is a gorgeous unit in beautiful location. Everything was perfect with one exception. We were unable to connect to Wi-Fi in the back bedrooms. This was a minor inconvenience. We were told a tech would come out to fix the situation However, a tech never arrived. First let me say....this is one great place! There were 7 of us and we had tons of room. Everything about the condo was beautiful. 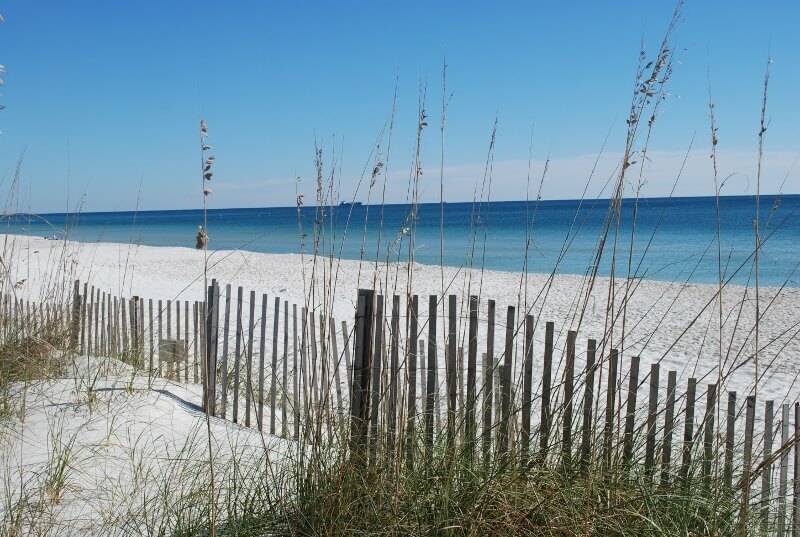 Have stayed in Destin and Perdido Key previously but Gulf Shores is the best place to be. The kids loved that they could swim in the indoor pool even in the rain. Just an all round wonderful time was had by all !! !